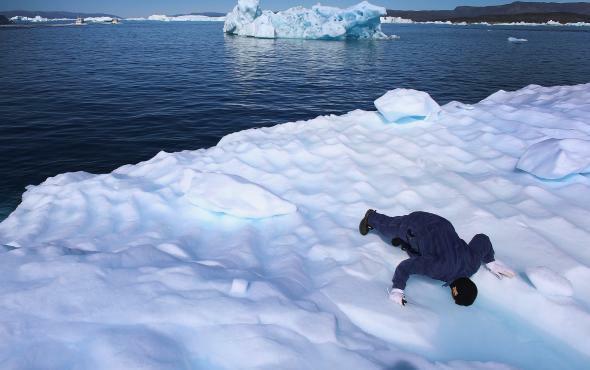 A man drinks the melted ice gathered on an iceberg that broke off from the Jakobshavn Glacier, as he takes some of the ice to study, on July 21, 2013 in Ilulissat, Greenland. Is the sky blue? Is the Earth round? Is the world getting warmer because of people? Facts shouldn’t change based on what side of the political aisle you sit on, and yet … here’s some depressing news: Just 27 percent of Republicans believe the Earth is warming due to human activity compared to 71 percent of Democrats, according to a new report released by the Pew Research Center on Wednesday. Keep in mind that the majority of Americans agree that global warming is serious and real. The controversy hinges on who should take the blame—with many Republicans remaining skeptical that the answer is humans. Even the U.S. Senate, which voted this year that climate change was not a hoax (gold star for you, U.S. Senate! ), can’t agree on the root cause of the phenomenon. The Pew report is just the latest piece of evidence reflecting the trend of political polarization in America: In the past two decades, we’ve drifted farther and farther apart based on political party. Though the science behind climate and energy issues hasn’t budged, our attitudes toward them continue to diverge. For the report, Pew surveyed 2,002 adults in 2014 to determine the influence that key factors such as political ideology, age, race, and gender had on their political beliefs. Global warming proved one of the issues most sharply divided across party lines, along with other climate and energy issues including offshore drilling, fracking, and nuclear power. In fact, on these issues, party identification was more likely to determine a respondent’s stance than even their level of education or scientific knowledge. Still, one would hope that more science education would coincide with greater support for science-based stances in general. And that was true to a point. Respondents with a greater understanding of science proved less afraid of scientific advancements and futuristic-sounding technologies: They were more likely to support using animals in scientific research, approve of expanding nuclear power, and consider genetically modified foods safe to eat. They were “especially likely” to approve using bioengineered organs for human transplant. Fortunately, politics was not the only factor at play. When it came to other science-based issues—such as the safety of eating GMO foods, space travel, animal research, and biomedicine—respondents were far less likely to have their views determined solely by their political leanings. Unsurprisingly, in the case of evolution, religion played a central role in determining people’s stances. Interestingly, though, those same respondents didn’t necessarily use religion to determine their stances on other scientific topics. The Pew report did reveal one surprising correlation between political parties about government spending and scientific research: The majority of both parties—83 percent of Democrats and 62 percent of Republicans—said government investment in scientific research paid off in the long run. Gold star for you, America!